Dear Dumb Diary - Book 4 - Never Do Anything, Ever. 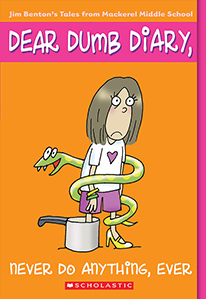 Home > Dear Dumb Diary > Dear Dumb Diary - Book 4 - Never Do Anything, Ever. Isablla said that she got the information about this charity online and I could help her collect for it if I wanted to, so as we made the rounds for the clothes, we also picked up a few bucks here and there for the Jevenile Optometry Federation. Hooray! Now I have a charity to work for. In your face Angeline - now I'm as gentle and sweet as you, you pig!! Sneak a peak inside the diary of Jaime Kelly, who promises that everything she writes is true... or at least as true as it needs to be.